Other Immunogen Type corresponding to Human MUC1. Delipidated human milk fat globule membrane. This antibody recognizes a peptide epitope (PDTR) within the VNTR region of the extracellular domain of MUC1 (PubMed ID: PMC3021526). Petrakou E et al. 1998: Epitope Mapping of Anti-MUC1 Mucin Protein Core Monoclonal Antibodies. Tumour Biology. Verhoeyen ME et al. 1993: Construction of a reshaped HMFG1 antibody and comparison of its fine specificity with that of the parent mouse antibody. Immunology. Our Abpromise guarantee covers the use of ab70475 in the following tested applications. WB Use at an assay dependent concentration. Predicted molecular weight: 122 kDa. IHC image of MUC1 staining in human normal colon formalin fixed paraffin embedded tissue section*, performed on a Leica Bond™ system using the standard protocol F. The section was pre-treated using heat mediated antigen retrieval with sodium citrate buffer (pH6, epitope retrieval solution 1) for 20 mins. The section was then incubated with ab70475, 5µg/ml, for 15 mins at room temperature and detected using an HRP conjugated compact polymer system. DAB was used as the chromogen. The section was then counterstained with haematoxylin and mounted with DPX. Ab70475 staining human normal lung. Staining is localised to the apical membrane. Left panel: with primary antibody at 1 ug/ml. Right panel: isotype control. Sections were stained using an automated system DAKO Autostainer Plus , at room temperature. Sections were rehydrated and antigen retrieved with the Dako 3-in-1 antigen retrieval buffers EDTA pH 9.0 in a DAKO PT Link. Slides were peroxidase blocked in 3% H2O2 in methanol for 10 minutes. They were then blocked with Dako Protein block for 10 minutes (containing casein 0.25% in PBS) then incubated with primary antibody for 20 minutes and detected with Dako Envision Flex amplification kit for 30 minutes. Colorimetric detection was completed with diaminobenzidine for 5 minutes. Slides were counterstained with Haematoxylin and coverslipped under DePeX. Please note that for manual staining we recommend to optimize the primary antibody concentration and incubation time (overnight incubation), and amplification may be required. ab70475 stained MCF7 cells. The cells were 4% formaldehyde fixed for 10 minutes and then incubated in 1%BSA / 10% normal Goat serum / 0.3M glycine in 0.1% PBS-Tween for 1hour at room temperature to permeabilise the cells and block non-specific protein-protein interactions. The cells were then incubated with the antibody (ab70475 at 10µg/ml) overnight at +4°C. The secondary antibody (pseudo-colored green) was ab150117 Goat Anti-Mouse IgG H&L (Alexa Fluor® 488) preadsorbed used at a 1/1000 dilution for 1hour at room temperature. ab195889 Anti-alpha Tubulin (Alexa Fluor® 594) was used as a counterstaining (pseudo-colored red) at a 1/250 dilution for 1hour at room temperature. DAPI was used to stain the cell nuclei (pseudo-colored blue) at a concentration of 1.43µM for 1hour at room temperature. Immunocytochemistry - Anti-MUC1 antibody [HMFG1 (aka 1.10.F3)] (ab70475)Image courtesy of an anonymous Abreview. 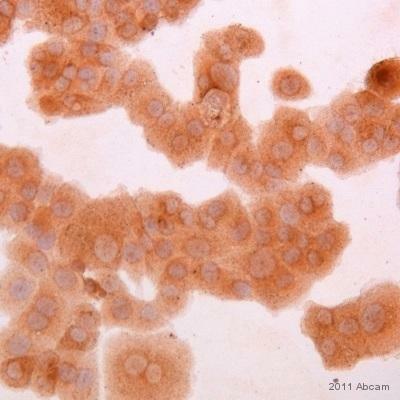 ab70475 staining MUC1 in human breast cancer cell line T47D by Immunocytochemistry. Cells were fixed in methanol, blocked using 10% serum for 5 minutes at 25°C and then incubated with ab70475 at a 1/100 dilution for 1 hour at 25°C. The secondary used was an undiluted HRP conjugated goat anti-mouse polyclonal. Publishing research using ab70475? Please let us know so that we can cite the reference in this datasheet. Do you know what the epitope region of this antibody is? Delipidated human milk fat globule was used as the immunogen for ab70475 and unfortunately the exact epitope region for ab70475 has not been mapped. I am sorry that I could not help further in this matter. Regarding the product Anti-MUC1 antibody [HMFG1 (aka 1.10.F3)] (ab70475). I read in multiple resources some conflict information about its reactivity with glycosylated MUC1 protein core. Some sources mentioned that it is glycosylation sensitive, while others said it's not. Could you please confirm that? I'm planning to use a type-O-glycosylation inhibitor prior to preparing the cell lysates for western blot. Is that gonna affect the binding of the antibody at all? We do not have in-house data for this clone other than the IHC and flow cytometry data, and it does not clarify whether glycosylation is required for reactivity. The older papers listed on the datasheet describe production and characterization, in particular the Taylor-Papadimitriou paper and the Burchell papers. I do not have access to the full articles though, so I do not know whether the antibody was tested for relative reactivity with glycosylated and de-glycosylated/non-glycosylated MUC1. Customer kindly contacted us regarding the dilution of ab70475 and ab99632 for western blot, as well as our detection substrates for detecting HRP. As we discussed, for purified primary antibodies such as ab70475 we recommend a starting dilution of 1ug/ml for western blot. For the secondary antibody ab99632, we were able to see a band in western blot from a dilution range of 1:2,000 to 1:10,000, with the band becoming increasingly fainter at increased dilutions. I had a question about your antibody https://www.abcam.com/MUC1-antibody-HMFG1-aka-1-10-F3-ab70475.html. Its clone HMFG1. My question is this antibody cross-reactive with other mucins, MUC16 in particular. I did flow cytometry on MUC16 rich OVCAR-3 cells with MUC1(HMFG1, ab70475) and MUC16(X75) and both stained very well. Then I tried two other MUC1 antibodies(ab108185-EPR1023 and cell signaling VU4H5) and there was no staining. I'm just wondering if the HMFG1 antibody is a really good or if it is just cross-reactive staining. We haven't tested this antibody for its cross-reactivity with MUC16. I BLASTed the MUC1 and MUC16 protein sequences, and there really isn't that much overlap. The greatest homology was around 20% and we generally say that >85% is necessary for cross-reactivity. Unfortunately I can't tell you definitively if the antibody is cross-reacting or not. The only real way to test it would be with a MUC16 recombinant protein, but unfortunately we do not carry any. The light chain type for ab70475 has not yet been determined. I am sorry I could not be more helpful. Please contact us again if you have any further questions.